Recently the Catholic Church has been wrestling with the significance of foot washing – the liturgical reenactment of Christ washing the feet of His Apostles on the night before He was betrayed. The Council of Elvira (Spain, AD 305) prohibited the washing of feet because heretical ideas were being associated with it: “The feet of the newly baptized are not to be washed by the priests or clerics” (Elvira 48). Saint Ambrose of Milan, against this rulings of the Council, considered foot washing to be “sacrament” of great importance. In Milan and other places, “foot washing” was a prelude to sacramental baptism. The Albigensian heretics held foot washing in high esteem and assigned to it a theological importance without parallel in the orthodox Catholic Church. Up until the last century, Popes, Abbots, and Kings would wash the feet of the poor as a sign of humility and servant leadership. More on that later. Up until 60 years ago, the custom of foot washing did not appear in the Roman Eucharistic liturgy. Until 1955, the Roman Missal included a rite of foot washing detached from the Mass. Pope Pius XII was the first Pope to have foot washing included in the Mass and it was stipulated that it would be the feet of men, presumably as a sign of the male-only priesthood. Hence, foot washing is relatively new liturgical rite. In 2013, Pope Francis washed the feet of two women and non-Christians (Muslims) at a juvenile detention center in Rome 2013. Pope Francis revised the direction of the Roman Missal in 2016 to include men and women as a sign of inclusion. I wrote a well-known book on Judaism and Catholicism that covers the liturgical and sacramental connections between the Old Testament and Catholic Christianity called The Crucified Rabbi: Judaism and the Origins of Catholic Christianity. It’s a popular text now in Catholic schools and seminaries. You can read reviews of it on amazon here. Saint Augustine and Cyprian associate the washing of feet with the removal of venial sins. This is why Christ says: “He that has been washed needs not but to wash his feet, but is clean throughout.” The Apostles were already baptized. Peter asks for a second baptism (his head) but Christ refuses. The Apostles had already been baptized and their sins removed, however, the lower sins that trip us up also have to be remitted before receiving the Holy Eucharist. Hence, the foot washing was a liturgical penitential rite prior to the First Communion of the Apostles. Is Right to Allow Women? Prior to Francis, the men chosen to receive foot washing symbolized the 12 Apostles. As described above, foot washing seems to be a priestly rite preparing the Apostles to have the “beautiful feet” foretold by Isaiah. Since men alone can be Catholic priests, only men were chosen for the washing of feet. One might argue, however, that Christ calls all men and women to proclaim the Gospel with beautiful feet. Proclaiming or sharing the Good News is not exclusively a sacerdotal action. Moreover, Saint Paul states that all Christians are called to crush Satan under their (beautiful) feet (Rom 16:19). The Coptic liturgy includes the act of the priest washing the feet of the entire congregation! So there is liturgical precedent for including women in the washing of the feet. Is it Right to Allow Non-Christians? 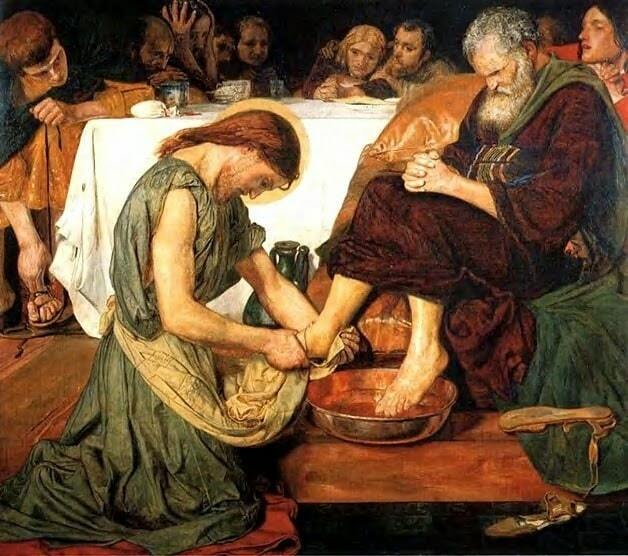 What I cannot reconcile theologically is the act of washing the feet of non-baptized members of other religions, namely adherents of Islam, within the Eucharistic liturgy. Peter’s words and Christ’s response presume that the recipients are “washed already,” that is, baptized. Foot washing is an intra-baptized experience. There is precedent for foot washing as a pre-baptismal rite (in the catechetical context of Easter baptisms), but it’s not clear that the Muslims receiving papal foot washing are preparing for baptism. My personal belief is that foot washings should be returned to their pre-1955 status. Popes, Abbots, Kings, Presidents, parents, et al. can wash the feet of anyone they like as a sign of humility outside the Eucharistic liturgical rites of the Church. If a Pope or King washes the feet of another outside of the liturgy, then it is simply a sign of humility. When it’s placed inside the context of Eucharistic liturgy, then we strain to attach a theological meaning to it…and that’s where we run into trouble. If we want to show outward acts of “inclusion” to the non-baptized, we could give give them blessed bread or other gifts. Or we could wash their feet in contexts that aren’t sacramental. Question: I would love to hear your thoughts on foot washing. Please keep the comments respectful. No bashing of the Vicar of Christ on earth. He is our Holy Father. You can leave a comment by clicking here.